April 2015 n Performance & Hotrod Business n 79 installations in 43 states and overseas. They receive and screen property turned in by military services. If property cannot be reutilized within the Department of Defense, it is further screened for trans- fer or donation to federal or state agen- cies or other qualified organizations. Only property that can't be reused is sold to the public as surplus." 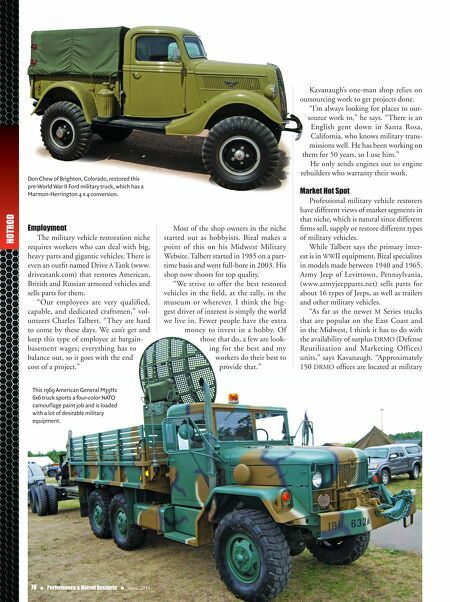 The Work Itself Universally, the experts we spoke to felt that military vehicle restoration is moving away from being a do-it-yourself job. "What I see in the military vehicle mar- ket is that vehicles in really good condi- tion are harder and harder to find," Talbert explains. "With people acquiring vehicles that need more attention, the cost of a top-notch restoration goes up. What I've seen over the last three to four years is a definite decline in the affordability of a nicely restored truck." M Series Rebuild provides restored vehi- cles built to better-than-new condition. "Bear in mind that 'restoration' means many things to different people," Talbert says. "At M Series, it means nothing at all is left unturned; we go down to the bare frame rails and back up to the complete rebuild of every component." Talbert says each individual body piece is blasted, etched and repaired using the best old-school methods, (not loaded up with body filler, etc.). Each part is epoxy- primed with high-build primer then painted with a urethane base coat and a clear coat. "If a client wants less, we can reduce quality a little," he notes, "but not to the point where problems will arise because of cutting corners." A Swing to Shops All of the experts we interviewed agree that a swing to using professional res- toration shops is a trend in the military vehicle hobby. They feel that everything is changing. Younger collectors want to drive a vehicle and have fun with it, but may not enjoy tinkering with a vintage vehicle. "We do Slantback upgrades, GMV con- versions and turbo upgrades and literally Photo shows a small portion of Chet Krause's military vehicle collec- tion, which was ultimately sold to a collector from Belgium. turn out new trucks that are built from the frame up with NOS parts," Kavanaugh says. These are upgrades the average hob- byist can't handle on a Hummer H1 or HMMWV in an at-home shop. Other buyers are not collectors at all. Tom Zat of Alfa Heaven in Anawa, Wisconsin, (www.alfaheaven.com) sells many of his camo-decorated, recondi- tioned military vehicles to hunters, fish- ermen and outdoors types. When he found out it was illegal to sell them in Wisconsin, he successfully fought the state law and got it changed. Now, his restored K-5 Blazers and other trucks are sold in 50 states. "I just had an electrician buy a big army truck and he's going to use it in his business," says Kavanaugh. "He's not a hobbyist, he's never going to buy another military vehicle and he'll never work on this one himself." When it needs service he'll take it back to Retired Warhorses and give Kavanaugh another job to do. 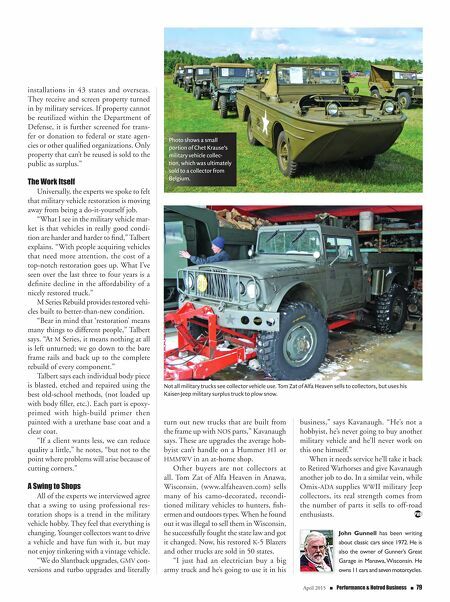 In a similar vein, while Omix-ADA supplies WWII military Jeep collectors, its real strength comes from the number of parts it sells to off-road enthusiasts. John Gunnell has been writing about classic cars since 1972. He is also the owner of Gunner's Great Garage in Manawa, Wisconsin. He owns 11 cars and seven motorcycles. Not all military trucks see collector vehicle use. Tom Zat of Alfa Heaven sells to collectors, but uses his Kaiser-Jeep military surplus truck to plow snow.